OVID Medline guide intended to provide basic information about Medline and how to search it. This module provides important basic information about Medline OVID needed for effective searching. OVID Medline is a bibliographic medical database that indexes around 5700 international journals in medicine and related health topics and is available from early 1900s to present. It is produced by the National Library of Medicine (NLM) and represents the main content of PubMed. Medline articles are indexed with subject headings called MeSH terms (Medical Subject Heading), designating the subject content of the article. So, searching Medline using a MeSH term guarantees that articles retrieved are talking about that particular concept. These MeSH terms are taken from a controlled vocabulary resulting in unified indexing. Searching with MeSH is one way to search Medline, another way is by searching with a keyword / textword. This second choice searches for all the occurrences of that particular word(s) as it appears in the indexed part of the Medline records (title, author, address, journal name, abstract...). A combination of the above methods should be performed in most cases to have a comprehensive literature search. MeSH searching is choice number one, as it retrieves articles discussing that particular concept. Keyword searching does not necessarily guarantee this and as a result many irrelevant records are retrieved while many relevant ones are missed. For example, if you are looking for "Acquired Immunodeficiency Syndrome", and you search Medline for AIDS as a keyword, irrelevant articles such as "Technical aids to patients with spinal cord injuries", are retrieved. Also articles about AIDS syndrome that do not mention AIDS in its abbreviated form in the title or abstract, are missed. When using keywords, "OR" all synonyms, variant spellings, singular, plural, adjectival, British, American, and abbreviated forms where applicable, and use truncation to ensure comprehensive retrieval. Medline groups the MeSH terms is in a hierarchical arrangement, where a broad MeSH groups its narrower MeSH terms and indents them under it in a tree-structure format. This allows the searcher to either search a broad MeSH term alone (to retrieve those articles that talk about the general aspect of that topic only) or to explode that broad MeSH term to also include all of its indented narrower MeSH terms, grouped together in an "OR" Boolean operation. Exploding the MeSH "mouth neoplasms", retrieves articles talking about any of the narrower MeSH terms included in all the above list combined in an "OR" relationship. Whereas exploding the MeSH "salivary gland neoplasms" retrieves articles talking about it or talking about any of its narrower MeSH terms "parotid neoplasms", or "sublingual gland neoplasms", or "submandibular gland neoplasms". Minor MeSH retrieves articles talking about that topic but not as the major theme. Major MeSH retrieves articles talking heavily about that particular MeSH. 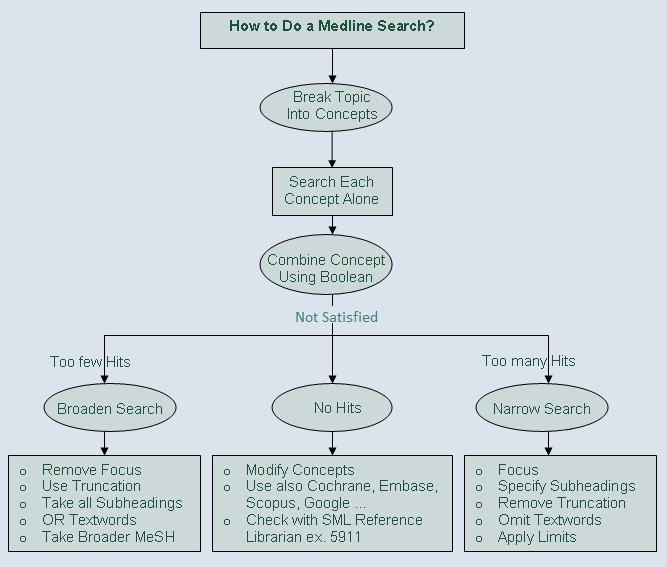 Medline articles have an average of ten MeSHes under which each article is indexed. Some of these the article would be discussing in great details (Major MeSH), others the article would be discussing as secondary topic (Minor MeSH). A user has the option to specify retrieval to only major MeSH by choosing Focus. If Focus is not selected, the user retrieves both major as well as minor MeSH. If you get too many Medline hits, focus MeSH to decrease retrieval to only those that the article discusses as main topics. Medline allows both external and internal truncation to use in textword or keyword searching. Internal truncation using ? which designates zero or one character only, so colo?r retrieves either color or colour. focus to search major MeSH. There is no one correct way to do all searches! If not satisfied, search Embase, Cinahl, Cochrane, Scopus, Google Scholar, etc... There is some overlap, but each has its unique results. Farha A and Nassar HT. Searching the medical literature using CD-ROMs: basic information and useful tips with special emphasis on MEDLINE. J Med Liban 46(1):48-51, Jan-Feb 1998.